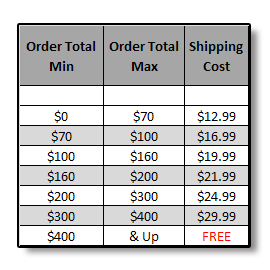 UreTop Pearl Urethane Topcoat 1.5 Gallon Kits - Buy Custom Paint For Your Automobile Or Motorcycle At Discount Prices! 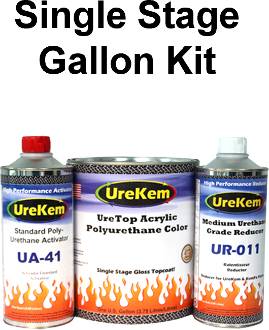 This listing features a kit containing a full GALLON of UreTop Polyurethane Topcoat PEARL color your choice, a QUART of activator and a QUART of reducer. UreTop combines durable urethane polymers and co-reactants with automotive grade pigment to create a line of high gloss urethane single stage colors that are easy to apply with great flow and leveling, and dry to a high gloss, high DOI, finish that lasts. Mixes 4:1:1 by volume. This kit is enough material to paint the average passenger vehicle. Some of our standard pearl colors are not suitable for single stage applications. The following colors are offered: Sunrise Orange Pearl, Sunset Orange Pearl, Orangelo Orange Pearl, Inferno Orange Pearl, Toxic Tomato Pearl, Rockin' Red Pearl, Cherry Bomb Pearl, Sparkling Merlot Pearl, Black Cherry Pearl, Black Gold Pearl, Static Grey Pearl, Tahitian Black Pearl, Phantom Black Pearl, Izit Brown Pearl, Root Beer Pearl, Copper Pearl, Molten Orange Pearl, Yella' Bellied Pearl, Holy Guacamole! Pearl, LimeTime Green Pearl, Olive Fab Green Pearl, Forest Green Pearl, Midnight Envy Pearl, Teal Mystique Pearl, Tru Blue Pearl, Pacific Blue Pearl, Proud Navy Pearl, Midnight Blue Pearl, Intruder Purple Pearl, Vibrant Violet Pearl, and Purple Passion Pearl, Midnight Shadow Blue Pearl.